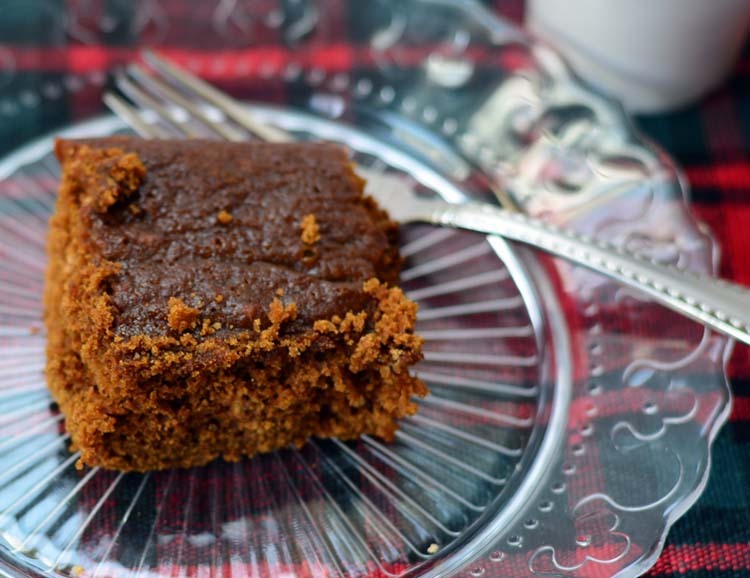 Gingerbread is an old fashion treat that is sure to please everyone in your family. When I was in high school I became infatuated with all things gingerbread. For some reason I assumed making gingerbread was difficult so I picked up a new pre-made mix. After about the third box of mix, I got bored with making cookies and decided to try the instructions on the box for making plain old gingerbread. It was fantastic! I couldn't believe I'd never had gingerbread this way before but I fell in love and have been making it from scratch since. This gingerbread is really more of a cake than a bread. Like most cakes, I normally butter and flour my cake pan before baking. But this year I took the Baking for Better Challenge (more info at the end of the post) and swapped out my butter with new Pompeian Grapeseed Oil Spray. I haven't purchased cooking spray in many years. I'm just not a fan of all the chemicals they add to the oil to make it spray worthy. So I was delighted to learn that Pompeian, the maker of my favorite grapeseed oil, has made their grapeseed oil a spray without adding any propellants, CFCs, or additives. But would the spray grapeseed oil work to keep my gingerbread from sticking to my cake pan? I was up for the challenge! I lightly sprayed the grapeseed oil on to the pan and floured it as I normally would. I'm terrible at making sure to get every nook and cranny, which is necessary for the cake not to stick. I whipped up my gingerbread batter and baked it as normal in the oiled and floured pan. I wish you could have smelled my house when it was baking. Better than a fancy candle any day! 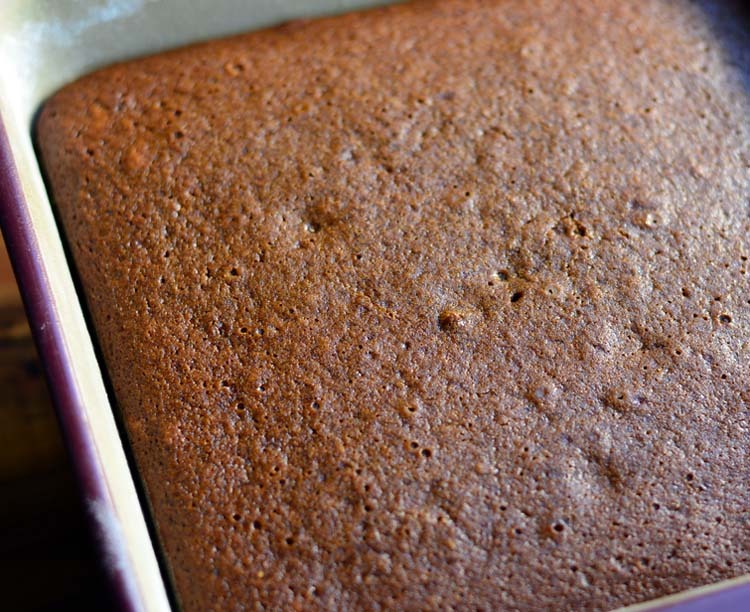 And voila – perfectly moist gingerbread. I'm happy to say that the gingerbread came right out of the pan. I didn't notice any difference from using the grapeseed oil instead of butter. Enter the Baking for Better Challenge! Are you ready to take the challenge? From November 4 – December 6, you can enter the Baking for Better Challenge sponsored by Pompeian and celebrity chef Duff Godman. 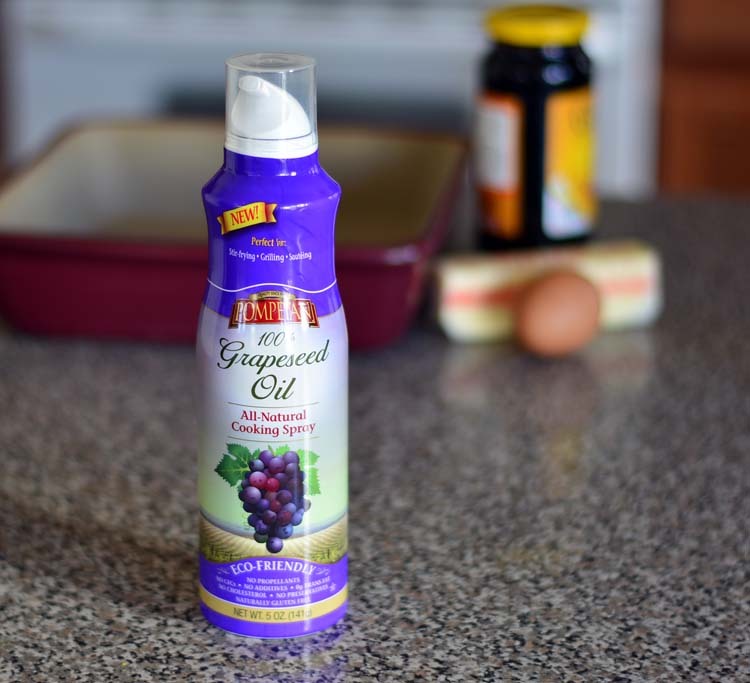 Just use the new Pompeian Grapeseed Oil Spray to better your holiday baking by using the new Grapeseed Oil Spray in your favorite holiday recipes. Simply follow @Pompeian on Instagram and upload a photo showing your new and improved baked goods made with Grapeseed Oil Spray. Make sure to use the #Bake4Better hashtag and tag @Pompeian when you upload your photo. Prepare a 9x9 bake pan by spraying lightly with Pompeian Grapeseed Oil. 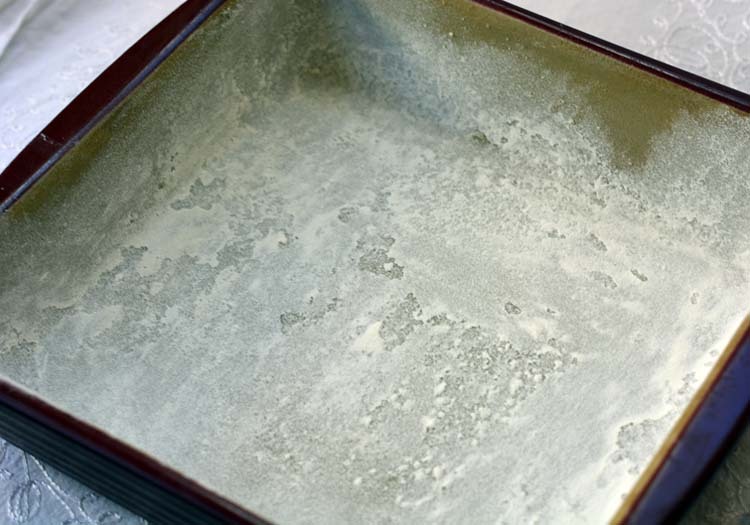 Add flour to the pan and gently tap around to completely coat the pan with flour. Set aside. In the bowl of a stand mixer, beat the butter until light and fluffy. Add the egg and brown sugar to the butter and beat on high until light and fluffy. 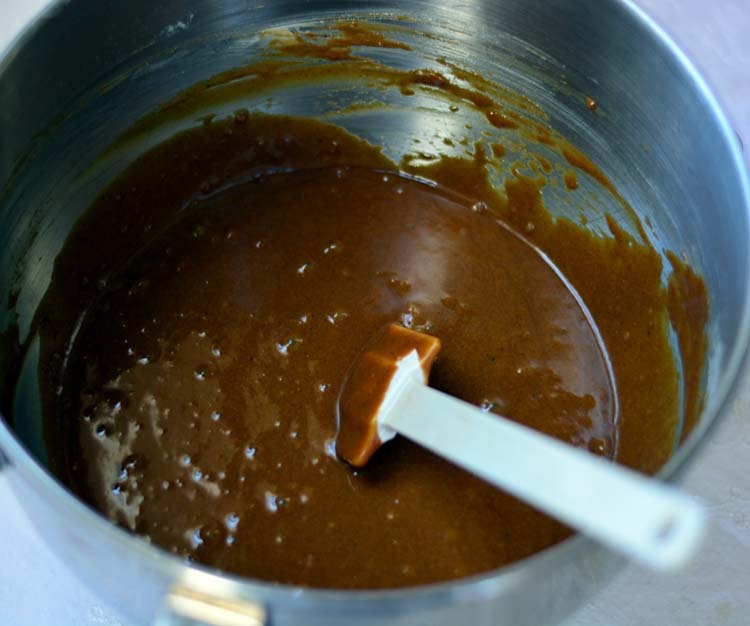 Turn mixer to medium speed and add in molasses. In a large bowl whisk together flour, baking soda, ginger, cinnamon, cloves and salt. Add dry ingredients to wet ingredients and mix just until ingredients are combined. Bring 1/2 cup of water to a boil and carefully add to the batter. Stir to mix. Pour batter in to prepared pan. Bake for 35-40 minutes or until a toothpick inserted in the middle of the cake comes out clean. Your Old Fashioned Gingerbread looks so rich and delicious. What a lovely seasonal treat! Thank you for sharing the recipe with us at The Hearth and Soul Hop. This looks delicious! I recently bought a kitchen product from Pampered Chef that uses air to turn any oil into a spray. I’m so excited to try it out!!! Thanks for sharing this delicious looking gingerbread at the Pinworthy Project Party on Planned in Pencil. Yes, I’ve had a few of those but after a while, they stopped working for me. :-/ I do love Pampered Chef, though! 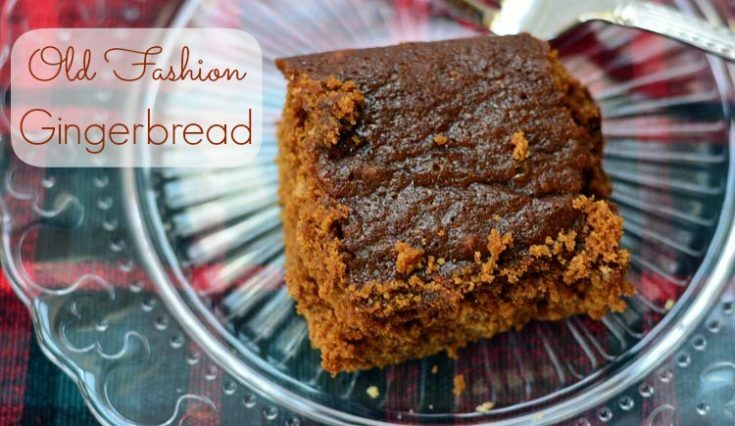 Your Gingerbread looks so warm and comforting on this cold rainy day. Thanks so much for sharing your great recipe with Full Plate Thursday and enjoy your Thanksgiving week! Camille, I’ve been looking for a cake-like gingerbread and this looks like just the ticket! I loved this treat growing up, especially with a nice dollop of freshly whipped cream 🙂 Looks delicious! This looks simply delicious! The photos are so clear and crisp. I’ve never made a gingerbread cake. We have made gingerbread cookies. Definitely, thinking about trying this…. Your gingerbread looks nice and sticky, very yummy. Visiting from Time to Sparkle. My mouth is watering just looking at this recipe! Thanks, Betsy! It’s one of my favorites. My husband would love this recipe! Thanks for the great holiday tasting treat! I have been craving gingerbread lately and was planning on making some this weekend. This is one of our favorite fall desserts. I love the look of gingerbread cookies, but eating them not so much. Your recipe though looks like something that I would really like. Oh, my goodness. That looks delicious. I just bought iced gingerbread cookies at Aldi tonight, lol. I’m a sucker for gingerbread. Yum, I love gingerbread stuff! Looks delicious! I don’t buy cooking spray for the same reasons as you. Good to know there’s a spray out there without nasty additives. I have never seen grapeseed oil in a spray can before. Will have to be on the look out for it. And that gingerbread looks amazing. Your pictures make this dessert come to life! I love gingerbread. The best part – how good the house smells when you make it! I have never made gingerbread before. I hate to admit it but I have always bought pre-made gingerbread. I am going to have to try this out.